The expected lines of retro design are given a bold update in the Liatris Collection. Bookmatch acacia veneer is highlighted with a gray undertone that serves to reflect the natural highs and lows of the wood’s grain. The sturdily angled legs are providing a solid support structure to each piece. 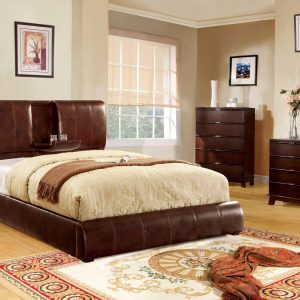 The ultra-low profile of the bed maintains the sleek look of the collection as does the clean framing of the case goods.